British government’s lack of interest in the Skripals’ “friend” ”at Zizzi’s” implies its involvement in their poisoning. They are now missing and presumed dead. Sergei Skripal was a former Russian double agent for Britain. After a high-profile spy swap in 2010, he lived in Salisbury, England, near his former MI6 handler, who he reportedly kept in touch with. Late in the afternoon of March 4th, Skripal and his daughter Yulia, who had flown in from Moscow to get Sergei’s blessing for a marriage, were found unconscious on a Salisbury park bench. The Skripals’ activities on March 4th are largely unknown because the GPS of their cell phones had been turned off for the four hours before they were found (1) and many of Salisbury’s CCTVs were not working (2). Sergei’s red BMW had been spotted at 9:15 am near the cemetery where Yulia’s mother and brother were buried, and at 1:35 pm when they parked near Salisbury’s popular Maltings shopping area. 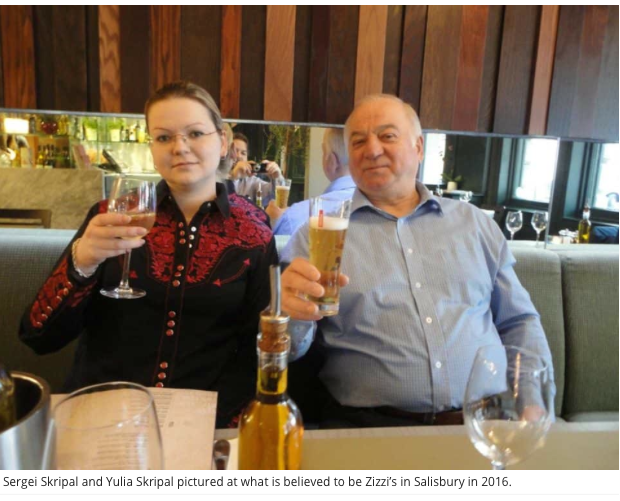 This photo of the Skripals, described as at Zizzi’s (3) indicates that Sergei knew the photographer, who shares their table. Less than 45 minutes after they left, they would be found in distress on the Maltings Park bench. Although there is apparently no attribution for the photograph, the photographer inadvertently took his own picture because of the mirror behind the Skripals. Sergei’s friend — the last person who may have seen them before their collapse — should have been a major person of interest. The UK government showed no interest in pursuing him. 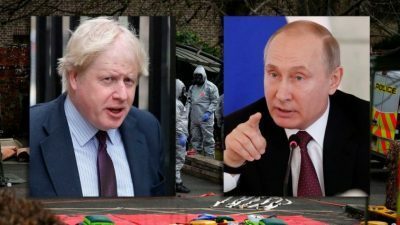 Within hours of news of the Skripals poisoning, Foreign Secretary Boris Johnson and Prime Minister Theresa May blamed Russia — with no evidence — for what they claimed was an attack with a nerve agent they called “Novichok”, better known as A-234. The Russian UN SC March 13th call for an inquiry on the poisoning was vetoed by the UK, which pressured countries to expel members of the Russian diplomatic corps. Despite the lack of evidence — and the many reasons why Russia would not have done this – almost 30 countries came to heel and about 150 Russians were expelled. The OPCW’s Spiez lab broke ranks to imply that Britain’s A-234 sample was not only fraudulent and could not have been used on the Skripals, but contained BZ (5), which only the US, UK and NATO countries possessed. Before Yulia was released from the hospital (“to a secure location”) she called her family in Russia. Within an hour of the Russian broadcast of her call, there was a bizarre British broadcast in which Yulia claimed that she wanted to be left alone and “At the moment I do not wish to avail myself of [Russian embassy] services”(6). The language used was not Yulia’s. Around the April 20th weekend when Sergei was expected to leave hospital, Britain announced that it had identified suspects in the poisoning — Russians, of course — who had already fled to Russia. There was no further news about the Skripals after that. The idea that had been floated, that they were to be given new American identities, was nonsensical; Yulia wanted to return to Russia and the two would be recognizable anywhere. Also, they could give media accounts of what had happened to them — stories that Britain would not have permitted because they would expose the UK leaders to be liars of the first order, and possibly brought down the government. The Russians escalated their attempts to contact Yulia to the United Nations Security Council on Monday, April 23rd, but were rebuffed by the British claim that she did not want to speak to them. In fact, given her silence, many suspected that Yulia was dead. “If [Skripal] also was also involved in the ‘golden showers’ dossier then elements in the US would have a reason to act as well. Did a “non-lethal” message to Skripal about greed take on a life of its own after Theresa May and Boris Johnson chose to weaponize their own government’s act against Russia? Who will be held responsible for the “deaths” of Sergei and Yulia Skripal?